Brianna describes her time at Northwestern as “a joyful part of my journey.” She was actively involved on campus through athletics, service opportunities and communications co-curriculars. Though she wasn’t settled on a public relations degree when she entered college, she found her niche through the many “real-world” experiences the program offered. 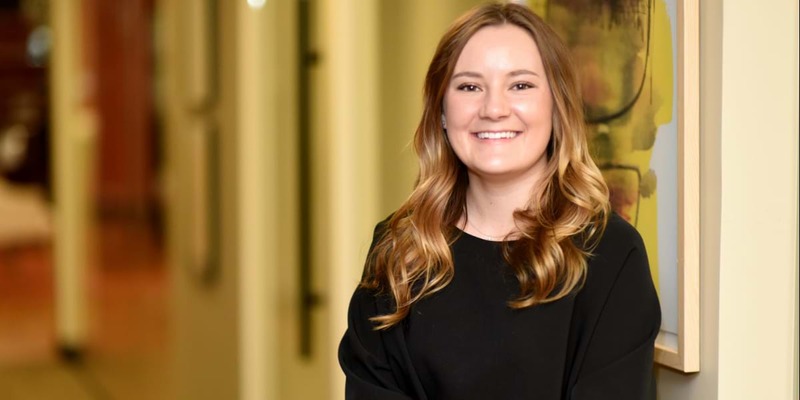 After graduation, Brianna returned to her home state of Colorado to serve clients through her work with a communications agency. I initially was interested in Northwestern because I wanted to play softball at the collegiate level. When I toured campus as a high school senior, I was amazed by how joyful everyone was. Everyone said “hi” when they passed each other on the sidewalks, and I felt welcomed into the community before I was even a Northwestern student. What did you appreciate most about your NWC education? The support I received from professors. They were all invested in seeing us succeed both during and after college. Their doors were always open, and I felt able to approach them not only with questions about classes, but also with questions about faith and life in general. What is your role at Communications Strategy Group? As a consultant, I work with clients to provide recommendations and help distribute content, much of which is digital. This can take on many forms, including paid social media, organic social media and pay-per-click online advertising. I also help clients gain earned media coverage and create strategies for social media channels. I mainly work with clients in the finance and education industries, but CSG also has consumer and health and wellness clients. How did your Northwestern education prepare you for your job? The hands-on experience and challenges I had every day prepared me for my job. In several of my classes, I was given the opportunity to help real businesses by creating blogs, redesigning websites, preparing social media images, shooting videos and taking photos. These experiences gave me valuable career skills, such as networking and implementing feedback from clients. I also worked with the Beacon (Northwestern’s student newspaper) as a reporter and advertising manager, which helped me build relationships and understand what being a reporter entails. Northwestern equipped me with intangible skills to be successful: an attitude of servanthood, the ability to be a sponge to soak up knowledge, and the tools to be proactive. What was residence life like at Northwestern? There was always something happening, whether it was in the residence halls or somewhere on campus. During my time at Northwestern, I lived in a dorm and apartments. Through all of these experiences, I always felt welcomed and supported by my roommates and resident assistants. What stands out to me is the fact that everyone kept their doors open in the dorms. It proved we were a community. Do you have a favorite memory from your time at NWC? So many things come to mind: spending time with my softball teammates, going to Praise and Worship, watching Airband and NC/DC, and helping build a website for a local nonprofit. I think what resonated with me the most was participating in the Summer of Service program. I went to Athens, Greece, to support a refugee ministry. It was life-changing. I realized God is bigger than the box I had been putting him in. When I returned, the entire SOS team gathered to process our summers. It was inspiring to hear how NWC students spread God’s love and light throughout the world that summer, and I realized we can be used as vessels of change for his glory. Why should prospective students choose Northwestern? I encourage others to choose Northwestern because I received so much more than a college degree. I found lifelong friends, but most importantly, I grew in my relationship with Jesus. NWC didn’t just form my knowledge—NWC formed me as a person. College is a time of discovery. You are discovering what you want to do after college. You’re discovering what it’s like to be away from home (for me, it was being 641.9 miles away from home). Most of all, you’re discovering yourself—and Northwestern fosters that self-discovery immensely.